Generations at Regency’s Cardiac Rehabilitation (rehab) is designed to provide monitored exercise and education after a heart event. Our professional staff will medically supervise and help heart patients recover quickly and improve their overall physical, mental, and social functioning. Our goal is to stabilize and slow or even reverse the progression of cardiovascular disease. 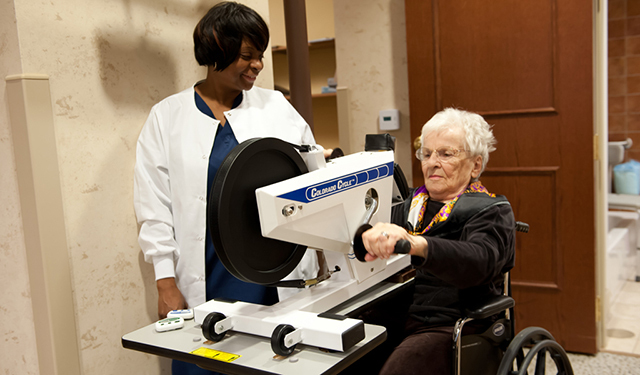 Our cardiac rehabilitation is modeled with a specific interest to promote a healthy lifestyle. We provide education, exercise, therapy, and tools to live with a healthy heart and a healthy mind resulting in a healthy life. If you have had a heart event, you may be afraid to exercise, or if you have never exercised, you may not know how to get started. Our cardiac rehab team will help you start slowly and work up to a level that is good for your heart. Safety is our highest priority. Emergency equipment and cardiac-trained personnel are on-hand to deal with any unusual situations should they occur. Cardiac rehabilitation teaches patients how to be more active and make lifestyle changes that can lead to a stronger heart and better health. Cardiac rehab can help patients feel better and reduce their risk of future heart problems. Qualifying events for patients may include: heart attack, balloon procedure, stent, valve repair or replacement, heart transplant, or coronary bypass surgery. The length of the program varies depending on the patient’s diagnosis, abilities, and progression in the program. The program consists of exercise, education, and risk factor modification. Patients are provided with an exercise regime prescribed by their physician, as well as consultation by a cardiologist. Cardiac rehabilitation is often divided into phases that involve monitored exercise, nutritional counseling, emotional support, and education about lifestyle changes to reduce risks of heart problems. Why Choose Generations at Regency for Cardiac Rehab? We help you manage your heart disease and problems such as high blood pressure and high cholesterol. We teach you proper exercise techniques. We provide a Heart Healthy diet. We teach and guide you to make better, healthier choices. We teach you to better manage stress and reduce stress and depression. We help you get back home/work sooner and more safely. In short: we help get patients back on their feet and living at their optimal state of mind and condition. The integration of cardiac rehabilitation at Generations at Regency is designed to better meet the needs of recovering cardiac patients and cardiac events.